“The styles in our collection are not innovative,” says Patrick Munsters, founder of the Dutch menswear brand Salle Privée. “Instead, we focus on perfecting the essentials in the best way that we can.” It’s a seemingly simple approach to menswear that is actually a radical step away from fashion-industry norms—where even heritage brands like Louis Vuitton and Moncler fly through trends (see the recent flush of streetwear-inspired styles from both as proof) so fast they’re bound to give anyone except the most obsessive shoppers sartorial whiplash. The result of Munsters’ laser-focus is a modest collection of covetable basics that are, crucially, available to buy all year, every year. “Just because a new season comes around, brands don’t need to produce new pieces,” he explains. “(Doing so) isn’t loyal to their customers, who so often want to buy the styles they like over and over again.” For Salle Privée, this means sticking to the types of pieces men wear day in, day out, like slimming chinos that aren’t too skinny, lightweight blazers, and casual Harrington jackets all in a cast of neutral greys, whites, navys, and blacks. New styles—like the supremely versatile cashmere Arvid rollneck sweater (£505) and an exclusive collection of 1970s-inspired evening wear launched on Mr Porter late last year—are only added to carefully fill holes in the permanent lineup. And though everything has been designed to pair together seamlessly (Munsters even goes as far to say you should be able to mix and match his styles with a blindfold on), streamlining silhouettes and doing away with nonessential details, nothing is boring. 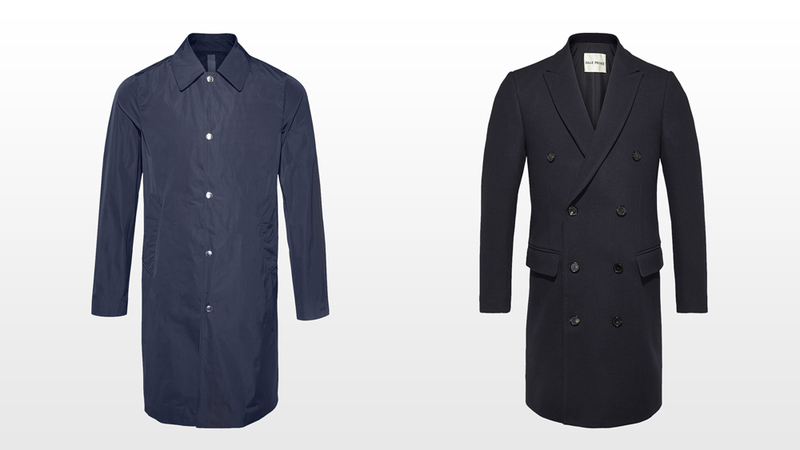 Sure, there are no flashy logos or psychedelic prints, but pieces like the Pierre raincoat (£685) and the Ives double-breasted overcoat (£1,515), a few of the designer’s favourite styles (shown below), have a certain self-assured swagger to them. They’ll look classic if you throw your favourite crisp white shirt and leather lace-ups into the mix, or give off a sporty, beatnik vibe worn unbuttoned with cuffed jeans and sneakers or chunky boots. Taken together, Salle Privée’s minimalist aesthetic is less about them and more about you. “(We) focus on styles that fit your personality more than styles that are in fashion,” Munsters says. Talk about a breath of fashionably fresh air.